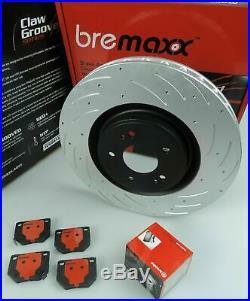 BREMBO pads & BREMAXX slotted disc brake rotors REAR for NISSAN R32 R33 R34 GTST. We have a New pair of Genuine Brembo Rear Brake Pads & Genuine Bremaxx Slotted & dimple drilled (claw grooved) rotors to suit Nissan R32 models with the standard sumitomo rear brake system, because every car deserves Brembo! These are to suit the two pin sumitomo caliper. (will not fit Brembo caliper). Please also check that your current rear rotors are 297mm in diameter before purchasing. Brembo is the undisputed global leader in the production of brake discs, calipers and complete braking systems. With its unrivalled expertise, Brembo produces everything from brake discs for the most popular cars in the European, American and Japanese markets to braking systems for the world's most prestigious and exclusive models. The superlative levels of technology and reliability of Brembo products is founded on an integrated production process which encompasses every stage in the production process, from research and development and testing to casting and machining. PLEASE ALSO NOTE: PICTURES DISPLAYED ARE FOR ILLUSTRATION PURPOSE AND MAY NOT DEPICT THE ACTUAL PRODUCT YOU RECEIVE. We are a Brake Speciality Store. We will try and beat any price. (Mon - Fri 9.00-4.30 est). Send through your VIN number for an accurate check on your vehicles Brake and Auto Parts. We know you're keen to receive your order as quickly as possible. We take care to pack every item securely to so it reaches you in brand new condition. Your order will be sent through Australia Post or one of our preferred couriers. All consignments are fully tracked. And we will do our best to make sure you're happy. Some manufacturers prefer that end users deal directly with them, and others prefer to work through us. And we'll make sure the correct process is followed so the issue can be addressed as quickly as possible for you. Each product we sell comes with automatic guarantees that cannot be excluded under Australian law. Where items are not received by us in brand new resalable condition, we will return them to you once you pay us the cost of redelivery to do so. Where redelivery costs are not paid within 30 days, we will consider the goods abandoned and may dispose of them without liability. For exchanges, we will cover the cost of sending a replacement product back to you. The item arrived damaged or missing parts. All orders leave our warehouse in brand new undamaged condition. It is important that you open your order as soon as you get it, and notify us immediately if there is any damage. So we can report it to our insurer, carrier and warehouse. We've been supplying quality car parts to Australian car owners, enthusiasts and mechanics for over 27 years. With a team of spare parts experts and on-call mechanics we can assist you in working out the correct part for your car. Subscribe to our newsletter to get the latest news & Updates. The item "BREMBO pads & BREMAXX slotted disc brake rotors REAR for NISSAN R32 R33 R34 GTST" is in sale since Monday, March 14, 2016. This item is in the category "Vehicle Parts & Accessories\Car & Truck Parts\Brakes & Brake Parts\Discs". The seller is "zoomzoomautoparts" and is located in Dandenong VIC. This item can be shipped to Australia, North, South, or Latin America, all countries in Europe, all countries in continental Asia, New Zealand.